So I spent my spinning the last 3 days working on ANOTHER teeny tiny yarn. Luckily, I only had a small amount of this to spin up so its all done! 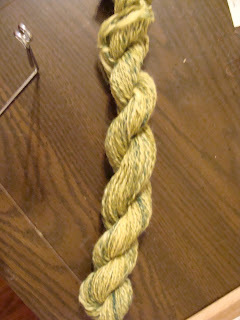 Above is a spinning shot and below comes the "it's been plied and I'm all done" shot. Pre-set this measures to approximately 58 yards, 2 ply. 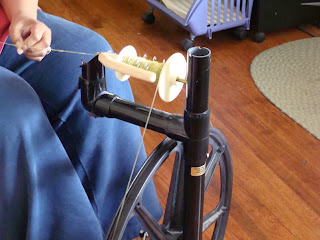 What an interesting spinning wheel you have here - what is it?